That’s good preachin’….Craig Groeschel kept saying that all through his message during his BOLD Series and to tell you the truth….IT WAS GOOD!! It is probably a message that I will go back and refer to over and over again. Here it is four months later and I am still going over and over the notes. Amazing Boldness ~ Boldness is behavior born out of belief. Acts 4:8-10 ~ Peter was filled with the Holy Spirit, empowered by God. He was not about to take the credit, but give all to the Glory of Jesus Christ. In verse 13, people were amazed at the Boldness of Peter and John, they were ordinary men, with no special training in scripture. 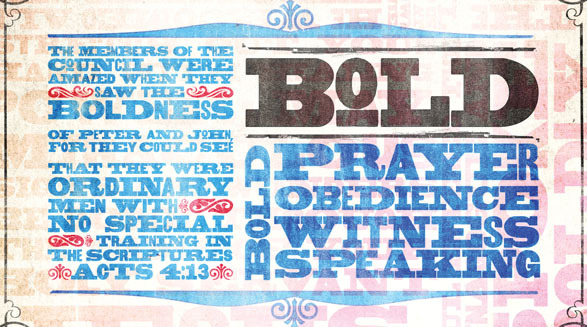 God gives ordinary people extraordinary Boldness. Your boldness should amaze the word!! When was the last time someone was amazed by your boldness?? Spiritual boldness comes from knowing Christ, and knowing Him intimately. What you pray reflects what you believe about God. Pray for the benefit of someone to lead them to Jesus. Reveal yourself to those who don’t know you! After they prayed, the place where they were meeting was shaken. And they were filled with the Holy Spirit and spoke the word of God boldly. Acts 4:31. God showed up, God showed off and God gets all the glory!! Use me today for Your glory!! We speak boldly about what we believe deeply!! Not a religion, but FREEDOM! If you knew my transformation, you will know why I am so passionate about Jesus!!! Jesus is that good! He has that much forgiveness!! I speak boldly because I believe that deeply! In Acts 5:17-20, it tells the story of the Apostles being arrested by the Sadducees and put into jail. When you walk in obedience, you will not be surprised! Remember, delayed obedience is disobedience and partial obedience is disobedience. Rick Warren talks about obedience in his YouVersion.com Bible study. Today, the word obey has a negative connotation. We view obedience as a forced, unwilling decision to do something we don’t want to do because we’re afraid of punishment. But that’s not the kind of obedience that’s in God’s Word. Obedience in the Bible means this: love + trust + action. It starts with love, as Jesus said in John 14:15, “If you love me, you will obey what I command.” (NIV) Obedience comes from knowing that God loves you and you love him in return. A lot of people think obedience is about fearing God, but God wants us to see obedience to him as a relationship of love. And out of love comes trust. If you trust what God is saying to you, and you believe that he loves you, then that will lead to action. You need to have all three because action without love is just rote religion. And love without action is just mere talk. If you’re not ready to face opposition for your obedience, you’re not ready to be used by God. My prayer~God use me Boldly to make you known in this world! Rick Warren is God’s messenger! He is amazing! Here is what he says about God’s plans for your life. When God wants to work in your life, he’ll always gives you a dream – about yourself, about what he wants you to do, about how he’s going to use your life to impact the world. In other words, if a dream comes from God, it will be so big in your life that you can’t do it on your own. It also will never contradict His Word! If your dream is something that the Bible speaks against, it’s not from God. He may be speaking to you now, but you just don’t recognize it for what it is. That dream you have – the idea, the concept – that thing you’ve been thinking about doing and would be of real benefit to other people, where do you think that idea came from? God starts with a dream as he builds faith in you.